Years ago I had a memorable session on Black Friday. 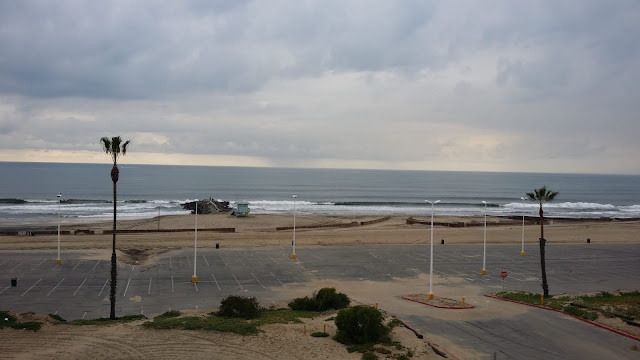 It was an unexpected huge day at Dockweiler, with offshore winds that blew back white caps like snow flurries. The water was glassy and it rained, the gentle rolling clouds only adding to the epic waves we were riding. I faced fears that day, though unfortunately, I caved when the big ones came. That session has always stuck out in my mind, and every Black Friday, I find myself wondering if it will ever return. Another epic session, another chance at redemption. Same spot, smaller day. Looks similar, but imagine bigger waves. As the days crept forward, I noticed the surf report improving. And when Black Friday arrived, it was bigger than expected! 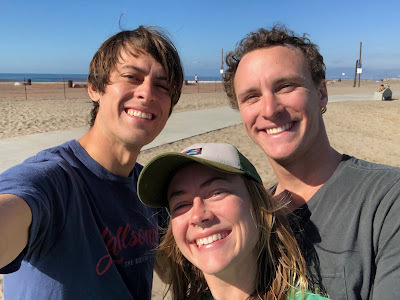 We ditched our plans for El Porto and opted for the slightly smaller (but far less crowded) Dockweiler, which is my favorite beach anyway. Waves were coming in like steamrollers, breaking in places I've never seen them break before. Smooth and glassy, large and fast. This looked like Black Friday 2013 all over again (minus the clouds, as this was a superb sunny California day). We suited up and I gave a little impromptu surf lesson to Kevin's girlfriend Allie, hoping she would find something fun on a bigger-than-usual day (she did). Paddling out, there was that all-too-familiar fear that crept up in my belly. These waves were large and steep -- just like the ones I chickened out on that fateful day five years ago. But experience and skill were on my side as I sat and watched a couple roll in (always a wise choice). Before I knew it, one came my way and I made a quick and very steep drop, then rode a little before it dumped. That was it. No big deal. Taken after the session. Smiles all around. Steep waves are very intimidating, especially for a beginner, and have kept me off many-a-wave over the years. But as I told Kevin, they ride almost the same. If you ignore the drop and just move and react like you do on any other wave, you will likely ride out just fine. And I did -- redemption! Wave after wave rolled in, and though they were big fast drops, they were pretty fun. I got a quick little smother of a barrel on one wave, hit a few corners and got some major speed on the good ones. All in all, it was a great session. Good waves, great weather, and overcoming fears. I certainly know what I am thankful for this year. My kids really love getting band aids. Maybe it's an art thing, or something sort of elusive but still somewhat attainable, that attracts them to band aids, but the whole thing is kind of ridiculous to me. When we found My Little Pony bandages at the dollar store, it was a practically a race for whoever could get hurt first to claim one. Every "booboo" is a chance, even if it doesn't warrant one, and trust me: most of them don't deserve the prize. This is one of those verses that doesn't really make sense. I'm supposed to be happy when I am insulted and slandered? How about I just sue them instead for defamation of character and then we can let it go? But Jesus says to rejoice, and I think it is because he sees the big picture. We are to think eternally, making these troubles that seem so real and relevant right now merely bumps in the road to our real home, a better place. Not only that, but Jesus says suffering for the right cause and in his name can actually make our lives in this eternal place better! Jesus is asking us to think bigger and see things the way he sees them, which is with an extremely wide perspective. If we do, it will change how we interpret some of the worst parts of life, turning them around completely. Back to the band aid...I want my kids to see beyond the cool little Twilight Sparkle bandage, and into a healthy, grateful life. Rejoice when you aren't hurt, because a lot of people are. So what if you don't get a cool band aid, or get to stay home and watch TV all day because you are sick? Some people are sick every day and face pain like this all the time. Think bigger, widen your perspective, and your life will be that much more full of gratitude, transforming the bad times into something positively all-encompassing and ultimately, richer. The faux-band my cousin, sister and I started in high school. I'm pretty good at being an old man. Maybe better than being a young one, some would say. What I mean is, things like getting going slow, waking up early, enjoying a scotch on the rocks and watching The Andy Griffith Show come naturally to me. They always have. 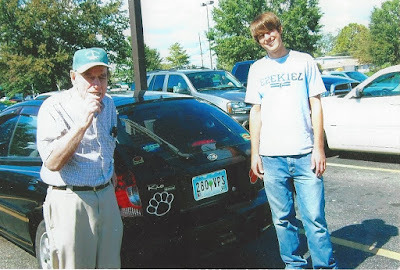 I used to love piddling around with my Grandfather, lazily going to lunch or shopping for cars (which he would take months to purchase, to the chagrin of the salesmen he made sure to spend lots of time talking to). Those were great relationship-building days, by the way, which I think a slower life lends itself well to. The thing is, though, I'm not really old. I'm only 32. But since moving to a big city, and experiencing a different slice of life out here, I am finding new ways to feel old. Things move faster here, which is a given -- I can deal with that. I still drive slow and consider it my mission to slow this city down. People are more career-focused -- I've been there and can relate. They often choose work over family or rest -- to each his own I suppose, though I have some harsher feelings about that. But one thing that has been a little harder to deal with is what I encounter at the local parks, the haven for my children. 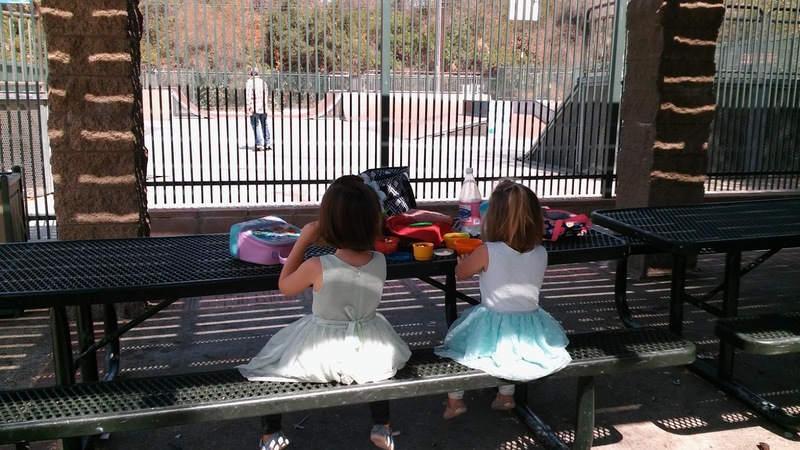 We visit a park nearly every day, and I love living close enough to walk to them, but they aren't always kid-friendly, which has been a difficult transition for me. Taken before going to lunch at Ryan's, my grandfather's favorite buffet. First off, the parks where I live are dirty. You can feel it in the sand. There is trash everywhere. I usually pick up some trash when I'm there, but it keeps coming. The thing is that it is usually snack food waste, which means some punk kids (there's the old man in me) are eating their Takis and then tossing the bag on the ground. What the heck?! Didn't someone tell them not to do that? It's everywhere though, and a standard of inner city life. The second thing I noticed is that more teenagers hang out at the local parks. 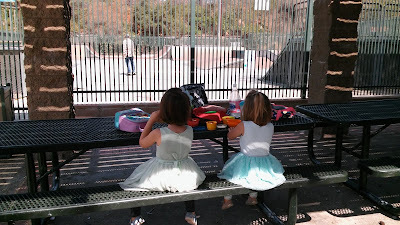 What prompted this blog post is a recent trip when I took the girls to a park before lunch, mid-morning. A group of high school kids were just hanging at the park (at 10AM?!). Of course they were cussing and saying lots of derogatory things about each other that I didn't want the girls to hear. (An aside: I'm pretty sensitive to the negativity amongst kids towards each other, and the youth pastor in me just wants to jump in and tell them to stop! Be nice to each other. Encourage each other. There is enough negativity in this world, don't add to it to make yourself feel better!) And then they were smoking weed, which brought the whole thing to a head. Why aren't these kids in school, I thought in my old man sort of way. Damn whippersnappers... I wasn't really sure what to do. Would asking them to stop help anything? My kids are going to be exposed to this stuff inevitably, when is the appropriate age for it to happen? Should I have called the cops, or would that just make things worse? Again, the youth pastor in me wanted to befriend them and show how following Jesus brings a healing and helping that all this weed and negativity can never do, but am I even the person to show them that? I ended up just leaving, feeling a bit sheepish for not making some sort of comment, but again, I was at a loss. The next day I returned and the park was silent, peaceful even. We played a little bit, which is when I found cat poop in the sandbox. Great, I thought, Another reason to not come to this park. But shouldn't I be more comfortable handling this city-life? One reason we came here was to give the girls a more exposed life, interacting with people who didn't look or sound like them. This is just part of that, right? But as the days wear on, I find myself gravitating to the parks about seven miles up the highway in the nice part of town. They are clean, shady with big trees (my main reason for going, actually). The people there are nice and don't smoke weed or cuss. High schoolers don't loiter on equipment designed for kids, because they are probably doing their homework or volunteering somewhere. (Right?) Is it wrong to want to go to these parks, where it is clean and safe? You're probably saying to yourself, "Of course, Rick! You're doing the right thing. Keep your kids safe and tell those pot-heads where to go if you ever stoop to the low of the local park again." I probably should have said something to those kids, you're right. But again, if we are in this neighborhood, I want to be a part of it, and that means taking it for all its good and bad parts. That is what Jesus did, right? Met people where they were at, hanging out with the lowly and marginalized. I don't know where Jesus would live if he were in Los Angeles, but I doubt it would be in the nice parts of town, where everyone has it all "figured out." And I don't think he would be afraid to take kids to a shady area every now and then, if not for the locals, for their own sakes. There is always a certain hesitation when approaching a new skatepark -- Is it built well? What kind of skaters frequent it? Are they nice? Will I be disturbing the homeless man living behind the quarter pipe if I skate too early? Tonight I tried Hazard Skatepark in east Los Angeles, and felt that familiar anxiety as I walked up. It was moderately populated, and had a very unique layout. But I immediately felt different in a few ways, all leading up to one blaring observation -- I'm kind of old. I wear a helmet most of the time now, mostly because I have two kids and my wife reminds me that I need to be a good example for them (as well as keep my brain intact). This headpiece right away sets me apart from about 99% of skaters at the typical skatepark in Los Angeles, because most of them don't require pads. Combine this with my high socks (to protect my shins) and Avett Brothers t-shirt, not to mention the color of my skin (or lack thereof), and I stick out like a sore thumb. But whatever...I can deal. I've been skating a long time and can hold my own against most kids. 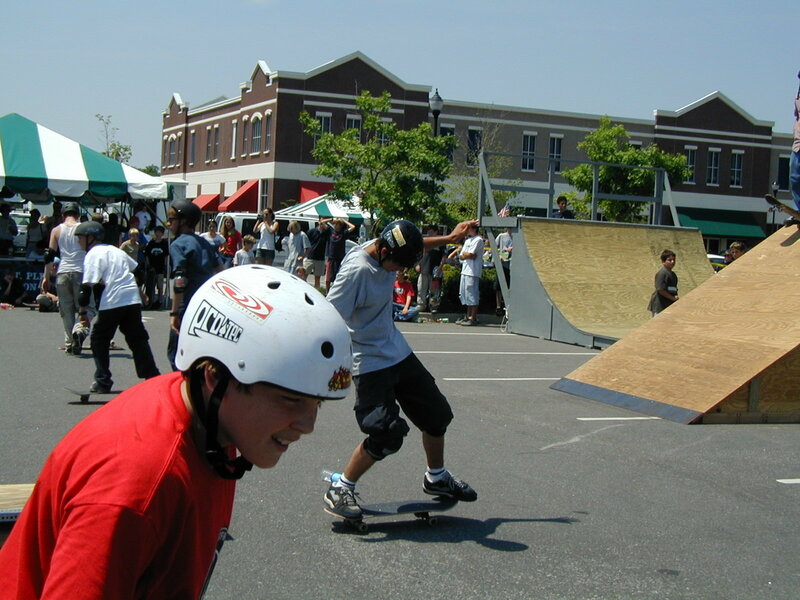 Speaking of high school...this is from a 2002 skate competition I did not do well in. Of course it only took about ten minutes before I almost ran into one of them, crossing the park going for an awkwardly placed arched quarter pipe while he was heading for the fun box. I apologized and went out of my way to hand him his board, but he hardly said anything, seemingly having an adolescent heart attack as he described the near-death experience to his friends. So then I felt like all eyes were on me, the weird old white guy with the helmet. Eventually the kid I almost sent to the hospital set up a barrier sign off of a kicker for people to jump. My feeble knees weren't feeling the rails and ledges I was working, so I decided to join them. This was my chance: kids were struggling to get over the sign, but I knew I could jump it easily (sometimes experience has its advantages over a youthful physique) -- and I did. Then I kickflipped it before anyone else, and after that backside 180'd over it. And though I may have shamed the other kid who was also trying to kickflip the sign, I felt a little redeemed, like I can still keep up. The reason I am writing all of this is because the whole experience just felt really ridiculous to me, but also somewhat relevant. I am pretty old to be skateboarding still -- that goes without saying -- but with that age comes the golden ability to not care what others think of you. I remember my mom telling me years ago that age brings a wisdom to acknowledge that it doesn't really matter what anyone thinks of you, and with that comes freedom to be who you want to be. It is a shame that for most people this takes about forty years to come to fruition (if not longer), and I am certainly no exception. I have come a long way in this regards, particularly compared to the peak of my skating career, where I would just shut down and stop skating if a few really good kids showed up. Now I typically don't let it bother me. But tonight showed me a new layer to this journey: In my younger years, ability dominated my thoughts. As an adult, I learned to not care. Now, as a skateboard-geriatric, I am realizing my age and therefore my difference from everyone else...and it has become distracting. So is that what it all boils down to: not wanting to be different? We all desire belonging -- I know I always wanted to fit in within the skateboarding world, though I never quite did -- but shouldn't it not be important now? Or is this all just the desperate meanderings of a man who can't quite let go?